If your company uses departmental voicemail boxes for incoming calls, you will want to record a professional sounding department voicemail greeting. This type of voicemail greeting is slightly different than the personal voicemail greeting that is associated with an individual's ​voicemail box. For example, if your telephone system allows for a group of telephone extensions to be "pooled" together to service all general accounting calls, then all the extensions from the Accounting Department can be pooled under the Accounting Department's general extension. When the automated attendant transfers a call to that extension, the next available extension will receive the call. If all Accounting Department extensions are busy or unavailable, then the call will be transferred to the department's voicemail box. General voicemail greeting: used as the default voicemail greeting if no other greeting type is set. Internal voicemail greeting: used to greet people who call your department from within your own company (i.e. from another extension). Generally, this is only applicable to very large companies. External voicemail greeting: played for people who call from outside your company. Your telephone system's automated attendant may play a general company greeting that all external callers will hear. If your company's name is mentioned in that greeting, you do not need to say it again in your departmental greeting. 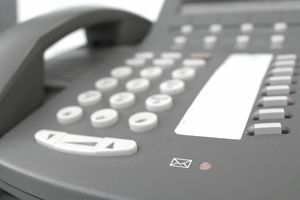 The temporary or out of office voicemail greeting: this is set when the entire department will be unavailable for a particular period of time. For example, the department is only staffed between 8:00 am and 5:00 pm or there is a mandatory department meeting that removes all people from answering the telephone. Most voicemail systems will allow you to set an expiration date and time so you don't have to remember to turn it off when your department returns to normal operations. On the phone (busy) voicemail greeting: This greeting is used to inform callers that the department is available but nobody can take their call immediately because all extensions in the department pool are busy with other callers. Do not begin with the "Your call is very important to us..." greeting. This phrase is overused and usually is a "turn off" to callers. Avoid giving out too much information and making an overly long greeting. You have reached the Accounting Department. All of our representatives are busy servicing other callers. Rather than wasting your valuable time on hold, we would like to return your call within two business hours. If you would like to return to the previous menu, press star now. Otherwise, leave us a detailed message with your name and number. After you record your message, you may press the pound key for more options. Thank you for calling. You have reached the Sales Department at Operations Tech, Inc. All of our sales representatives are busy serving other customers but we would like to return your call as soon as possible. For current pricing information or to check the status of your order, please visit us on the web. Otherwise, please leave us a message with your name and number after the tone. If you would like to return to the previous menu, press the star key now. You have reached the Accounting Department at Operations Tech, Inc. The department is currently closed. Our normal hours of operations are from 8:00 am to 5:00 pm Monday through Friday. We are closed on Saturdays and Sundays. You may press the star key at any time to return to the previous menu. Otherwise, please leave us a message with your name and number and we will return your call when the office reopens. You may hang up after leaving your message or press the pound key for additional options. Thank you for calling. You have reached the Sales Department. Leave us a message. Hello. You have reached the Accounting Department at XYZ.com. All the accountants are currently attending a mandatory department meeting and nobody is available to take your call. Your call is very important to us and we would like to return your call as soon as we return. However, it is the end of the year and our call backlog is very long. If you are calling about making a payment on an overdue account, please make sure to tell us in your message so we can call you back immediately. Otherwise, please wait for the tone and leave us a detailed confidential message. The department is closed. Please leave a message after the tone.